How much money can you earn money from your app? A great many businessmen ask this important and relevant question today, and it’s small wonder: as quantitative indicators show, the mobile application market became very popular nowadays. Analysts predict average app revenue growth in 2017: a 3.5-fold increase in the United States and Germany; a 3.2-fold increase in the UK and Brazil; a 3-fold increase in France; a 2.2-fold increase in Canada; a 1.8-fold increase in Japan and a 1.5-fold in South Korea. In general, over the past few years, approximate mobile app revenue (especially revenue from AppStore and Google Play) has grown by 130%, while revenues from In-App Advertising — by 60%. The numbers are really impressive! But what should you do to join those lucky ones who earn money from mobile app development? In other words, what is the best way to monetize apps? These questions are too complicated to answer them briefly. So, let's discuss (in detail!) 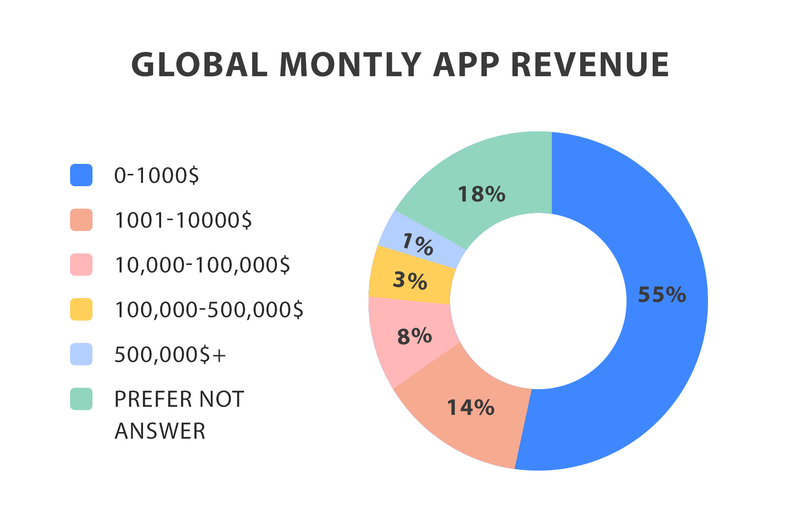 key app monetization strategies. So, the more successful the selected application, the higher the mobile app profits. And what application type do you need to choose, what will have the highest demand? The answer to the specified question will allow earning money on mobile apps without extra difficulties. Creating an app has become a business but not every startup becomes profitable. Success and fails in app’s building can be provided by many factors, and one of them is the right choice of the category of your future mobile program. Games and entertainment. The highest priority belongs to a category of entertainment (mostly games). There are several reasons explaining such popularity. First of all, various games and other entertainment applications are a great way to brighten up the time and get rid of boredom. On the other hand, entertainment gives us a dose of positive emotions which people need today more than ever. And, of course, we cannot ignore the gambling factor. Therefore, users are willing to download these programs. M-commerce. The second place in terms of profitability is occupied by purchases in mobile stores, which had grown by 30% in the United States last year. Messengers. Viber, WhatsApp, Facebook Messenger, Snapchat, and other similar instant messaging programs are very popular, and their owners get a good profit. Although these figures don’t mean other mobile services are hopeless. Not at all! We've just put the case of the most promising categories with maximal mobile app profits. Utilities, Education and Lifestyle categories are also profitable and popular. In fact, every program has a certain cellular app earning potential. You just need to find the right approach to monetization methods. Hopefully, now you believe that you’re able to make a profit from apps. But how to do it, what are the options? There is no the only answer because monetization schemes of mobile applications have been changing along with the rapid app market growth. Earning strategies are totally different, and there is no perfect business model, it doesn’t exist, at least - yet. Nevertheless, you can (and should!) find your unique way which best suits your personal needs. First of all, you should be aware that there is a free and paid app market, and each one requires its own approach. But, of course, the most interesting thing is to learn how to make money when your app is free. So, for a start, we'll focus on the mentioned issue by discussing a few free app monetization strategies. It’s a very popular way to make the app earn you money, which encourages users to conclude purchases right inside the program, in the process of its use. Moreover, purchases can be both real and virtual. 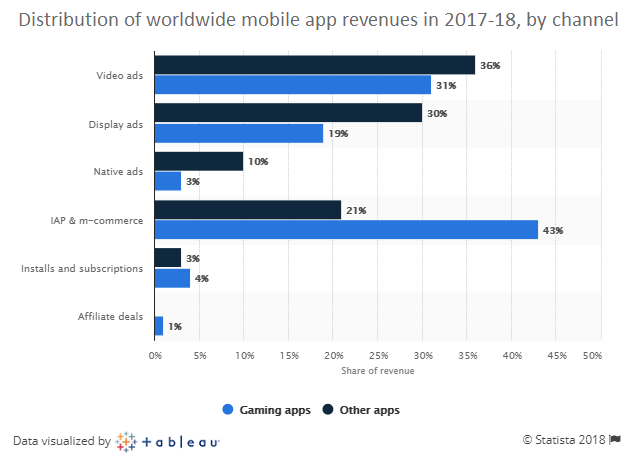 And although the revenue from in-app purchases is sometimes quite large, you need to remember that the majority of trading platforms take a large percentage of the profits (up to 30-40%). In addition, you should provide additional protection to prevent accidental purchases in the application (which sometimes happens, leading to user dissatisfaction). This popular method of monetization is especially easy to implement when it comes to games. You may come up with heaps of awesome in-app shopping ideas! How about these ones? Boosters that include different types of help: tooltips, rescue, pills, reminders, etc. These paid options are designed to help users pass challenging levels and obstacles more quickly. Of course, customers must perceive these options as an aid, not a way of your monetization. That’s why some boosters should be provided without payment (like a reward for completing the level or something of the sort). Trial boosters kindle the user's interest and allow him to experience all their benefits. Exclusive content. You can offer users optional, but valuable game elements, such as rare bonuses, disposable pills, special weapons... Buying them, the user gets access to additional features, and you earn some more money. The quantitative indicators. Offer your player to purchase a level life, new stamina, a boost... It's a quite simple way to enhance the average mobile app revenue. Decorative elements of the characters (costumes, accessories, toys, jewelry, tuning for cars, virtual money and more). Think of interesting decorative elements, offer them to the right audience - and make a profit! Also, you can make money with a free app using Lite and Pro versions. The whole scheme is rather simple: you offer people to test the free version of your app, trying to convince them to obtain even more fun by taking advantage of a full-fledged program. Say, your customers download the free demo version of the game and enjoy it until the point with artificial limitations, like the number of game levels, de-emphasized functionality, etc. And these limitations can be removed when purchasing a premium account. 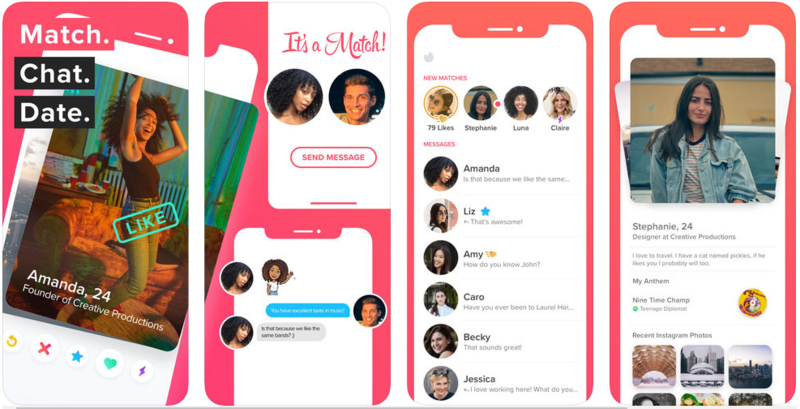 To explain the method by example, let's take a look at Tinder, a well-known dating web and mobile resource. It’s undoubtedly an excellent instance of a money making app. First, the user loads the base program and actively taking advantage of it. Over time, he realizes he'd get even more opportunities to expand his social circle if he removes certain limitations by acquiring Tinder Plus or Tinder Gold. And if Tinder managed to captivate the user with default features and convinced him that his life would be even better with advanced functionality, he'll be willing to buy the subscription. Freemium. The freemium model provides access to the basic app features but requires payment in order to get full functionality. The success of Freemium applications depends on the number of users who are loyal and ready to spend money on expanding the functionality. Subscriptions. The situation is similar to the previous one, but the focus is on the content (access to more diverse content per subscription). But remember, customers won't see the motivation to buy the subscription if the content is being poorly updated. Free app with exclusive paid features. So, a user should pay for in-app features (if he wants to enjoy them). Say, when using Skype or Viber, a person’s allowed to chat with other app users without payment. However, in order to make calls to mobile or landline phones, he'll have to replenish the account. Among the apps which make use of these monetization strategies, there are Angry Birds, Cut the Rope, Angry Birds Space HD, Fruit Ninja… These games have received the title of best selling in AppStore. This is one of the most profitable app revenue models. But remember: no annoying ads, otherwise, the user will delete your program. The proper advertising channel. Researches show that revenue from mobile in-app advertising has grown by 1.6 times over the last few years, having surpassed both mobile and desktop browser-based advertising. So it's very important to choose the right ad channel for your app. The advertising content. Your application should show only the ads relevant to users. We advise you not to act at random, but to carry out preliminary marketing research of user preferences. Native advertising which is organically placed in the application and adapts to its design and context. Push Notifications. Such a type of advertising has high conversion rates because you cannot accidentally click on the ad. Pop-up advertising. Ads are displayed in a dialog inside the app, offering the user a small call-to-action and OK and Cancel buttons. Video Embed. Quality videos are being shown inside the application. Usually, the server shows these ads to the users with a wi-fi connection which gives them the opportunity to watch the video without stopping from beginning to end. Making money creating apps may be implemented in different ways, and the monetization of data is one of them. There are different legal and quite profitable ways of selling information about a user (which you undoubtedly collect). In addition, user data can be used to influence non-mobile business options, as well as to accelerate the promotion of services to existing customers. Imagine: you want to build some kind of application but you understand that such a process is tedious and expensive. And it'd be much cheaper to buy the finished structure of the program and create a unique design - stick your label, so to speak (instead of creating a mobile service from scratch). The revenue developers make this way (or the owner of the code, which isn't the same), is sometimes very high. It’s a rather original way to earn money from your app, which is suitable if a mobile program is based on the blockchain protocol. For example, the Steepshot application pays cryptocurrency to users when they "like" the videos, images, and so on. The main part of tokens goes to content producers - those who publish photos and videos. The received funds can be cashed through the exchanges and transferred to the card. And the app owners receive a commission from each payment to the user. In such a case, free apps make money by showing the offers from the sponsor: if the user reaches a goal which has been set, he gets a discount from the sponsor. And the owner of the program, in turn, receives his intermediary percentage. A vivid example is the RunKeeper fitness app. Users are invited to perform certain actions to obtain gifts and discounts from brands. Such an option of earning money on mobile apps ensures a high level of user involvement, although it's not always easy to find sponsors with a similar target audience. Another popular way to get revenue from free apps is to provide access to all features for a certain trial period (usually from 7 to 30 days). After studying the application capabilities, the user is obliged to pay or delete the program. And your main task during the trial-use is to convince the person your service is worth the money. We've discussed main revenue models for free apps but there is a more direct method of earning: make an app paid. Such a method is extremely simple, however, its main drawback is the need to convince the user he must spend money on downloading a service which is completely unknown to him. Despite the risk, more than 25% of downloaded applications are paid, so you cannot just ignore such a monetization option. Just make sure your app is of the highest quality. Otherwise, you may disappoint those users who still dare to buy your program. Summing up, we should say: the monetization process is influenced by many factors: the app quality and functionality, visual support (design), the correct choice of the target audience, analysis of market needs, and more. And the creation of monetization strategies is also included in the list. And, most importantly, everything is constantly evolving, technologies are developing, and what seems to be the most popular free app revenue stream today may be the wrong choice tomorrow. So go with the tides and update your program from time to time. Think of a strategy. It’s very important to determine the monetization strategy before development starts. It’s too late to think about the best way to make money with a free app after the project has been completed. Combine several monetization methods. Don't be limited to one way to monetize apps. You may create a freemium model and connect the advertising block. The paid version will be ad-free and with additional functionality. Discounts. This is a classic marketing tool useful in all types of activities. Among other things, such a method will help raise the average app revenue. People love discounts, even imaginary ones! Discounts can be timed to holidays, to the first purchase inside the app, etc. The only limit is your own imagination. Social options involving gifts to users, the exchange of boosters, etc. It's not a very popular method of monetization, and app owners often ignore it. However, social options could be a very effective way of earning money. So don’t neglect such a monetization approach immediately, think about it carefully. Time events (such as daily quests and bonuses) are one of the most effective ways to retain the user, make the app earn you money, and increase its virality. Time events include bonuses for performing some actions, and a player is able to receive them daily (after successfully passing the level in a game, as an example). In other words, the gamer not just uses the app every day, but also prolongs the playing session, and it greatly increases the retention rate. Valuable proposal. The application should be interesting and (or) useful to the potential user. To get a foretaste of the idea, take a look at the popular news apps, including Flipboard, BuzzFeed, Zinio, and Pocket: they collect news content from different sources, solve the problem of multiple transitions from one application to another, and allow reading all the interesting news from the single place. Stand out from the crowd. AppStore and Google Play offer users millions of apps. Your task is to stand out from the crowd! There are different methods to draw attention to your program; the easiest one is to use inner resources of App Store and Google Play. Here are a couple of examples of the sort: choosing the right category, receiving positive reviews and ratings, making screenshots which demonstrate what your application promises users to do, etc. New users. Of course, you'll need a large user base for obtaining sufficient mobile app profits. Therefore, you’ll have to actively use all sorts of marketing tools to expand your target audience. Continuous development. The app should engage the users, every day offering them something fresh new. Leading news outlets such as USA Today, CNN and the BBC, involve users by allowing them to generate their own content: they can upload different stories, pictures, and videos and share them with the community. Think of your own “schtick” or take the example of successful companies. User experience. Refrain from monetization schemes of mobile applications, which worsen the user experience. Your task is to make users your allies! So the main rule: track, analyze, explore, and optimize! Always control your app's effectiveness and improve those areas which need extra attention to keep the users satisfied and engaged. And, of course, follow market trends. We guess now you know the most profitable app revenue models and ways to make money with a free app. And your new task is to find a competent developer able to consider all the nuances and to avoid pitfalls. We offer our services! Our company has solid experience in the field of mobile application development. Our experts’ve performed a number of successful projects which you can read about here. Contact us! We’re open for discussions and ready to advise you in detail. Waiting for your requests! The number of companies that develop mobile applications for business purposes is steadily increasing. Mobile apps as a communication tool have proved its value, so now mobile applications are demanded in business sector. Management of household finances involves not only entry of all expenses into mobile application, but the rejection of bad habits too. In this article we want to consider the bad habits connected with money and how mobile apps could help to avoid them.